Siblings Te Aorere and Te Ataakura Pewhairangi (Ngāti Porou) grew up with te reo Māori as their first language at home and school. They graduated at last week’s College of Humanities and Social Sciences ceremony gaining degrees in arts and teaching, with te reo central to their studies and futures. The high achieving Palmerston North-born and raised brother and sister are passionate about nurturing, developing and sharing their cultural knowledge and language through education and media. That drive and commitment, they say, comes from being raised by parents dedicated to ensuring their children were fully immersed in Te Reo Māori and Te Ao Māori. 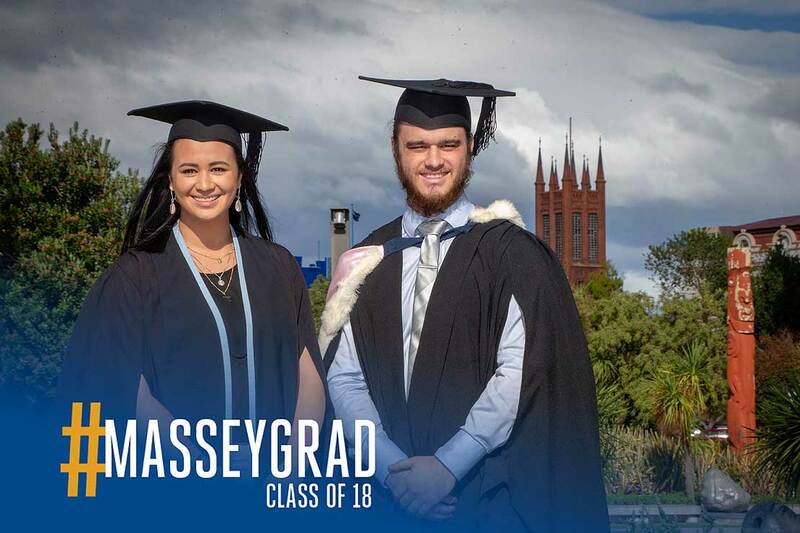 Te Aorere, who graduated with a Bachelor of Arts (Māori Studies and Media Studies), faced formidable challenges on his path to being capped at Massey’s College of Humanities and Social Sciences ceremony. His university journey began when he combined part-time distance study with playing rugby league for the Parramatta Eels Under-18s team in Sydney on a one-year contract before returning home to play for an Auckland club. His older brother Api, who graduated in 2014, was playing for the same club and also studying for a BA at Massey at the time. “It was expected. Our parents went to university so for us it was just normal,” Te Aorere says. But his study and sport were interrupted when he suffered a major concussion through a sports injury four years ago. Te Aorere recalls his first month after that lying in a dark room unable to read or watch TV because of sensitivity to light and sound. He was incapacitated for eight months with severe headaches, nausea, unable to concentrate as well as experiencing anxiety and depression. While undergoing rehabilitation and therapy, he managed to continue his studies and translation work at Māori TV, admitting it was very hard going. It took two years before he was fully recovered. He currently works at Māori TV in Auckland as a translator, subtitle editor and sports news presenter and is also working on a collaborative Master of Arts in Māori broadcasting at Waikato University with his partner and Māori TV colleague Kimiora Kaire-Melbourne (Tūhoe, Ngāpuhi, Ngāti Kahungunu). They are developing a Māori broadcasting model, which they hope will act as a base for Māori media outlets, and a tool for tertiary and secondary school providers to train Māori broadcasters with a Māori world-view. He says studying for a BA has given him a deeper critical understanding of many dimensions of Māori knowledge, including the history and settlement processes of the Treaty of Waitangi, as well understandings of his culture in the context of colonisation, race relations and indigenous rights. Te Ataakura, who graduated with a Graduate Diploma in Teaching (Secondary) and has a Bachelor of Arts majoring in Māori studies, also from Massey, broke new ground in her degree by completing all but one paper in te reo. Along with her siblings, she attended Palmerston North’s Mana Tamariki, where pre-school, primary and secondary schooling is delivered in te reo Māori. She completed schooling at the age of 16 with University Entrance, then moved to Auckland to start a career in television and the distance learning option allowed her to work and study concurrently. She is now tutoring Māori language papers and an introduction paper into te ao Māori at Massey’s Auckland campus and hopes to complete her master’s in the near future.